History: (What If? II#96 (fb) - BTS) - Eric Magnus Lehnsherr and his family spent time in a camp during the Holocaust of World War II. After the Holocaust, Eric, his daughter Anya, and wife Magda traveled through Europe, stopping in Vinnitsa where they purchased a room in a local inn with the last of their money. Magda (who was secretly pregnant) remained in the inn with Anya while Eric left the inn in an attempt to find a job. (What If? II#96 (fb)) - When Eric returned from job hunting, he found the inn on fire with his wife and child trapped within as the townspeople of Vinnitsa watched on, doing nothing to save them. Eric dove into the blazing inn, trying to save his family. When he heard Anya scream, Eric's mutant powers manifested, allowing him to pull his daughter to safety and rescue Magda. After rescuing them, he explained to Magda that hay bails had been placed outside of the inn, proving that the townsfolk had tried to kill them for being different. The event changed Eric, causing him to shelter his children from the bloodshed of others. Eric eventually learned of Magda's pregnancy and was there when the children were born. (What If? II#96 (fb)) - Fourteen years later, Anya led her siblings, Pietro and Wanda, on a hike up a mountain. Pietro attempted to scare Anya by taking a shortcut, but he knocked over some rocks, ruining his own trick. Anya then suggested that the three camp where they were, but Pietro excitedly announced that he was not going back home, but into town. Anya angrily told him that he could not go because their father would blame her for him leaving. Before the argument could continue, however, Pietro leapt away. Anya and Wanda returned to their home and explained to Eric what had happened, who immediately left a clandestine meeting to find his son. Eric soon found Pietro moving at superhuman speed across the wilderness and confronted him, scolding him for planning a trip into town. Pietro defiantly said that his father could not stop him and before he could even blink, Pietro was gone. (What If? II#96) - Three months after the confrontation with his father, Pietro had made his home in the city, spending his night wandering and stealing. He eventually found a home at a local school, where he met Tova Voorman. As Pietro continually tried to impress Tova, his father Eric began his plans against humanity, often taken his aggressions out verbally on Anya. When Tova tricked Pietro into beating up her older brother, the coach at the school tried to get him into extracurricular boxing, but Pietro proved to be a whiz at track, given his mutant super-speed. Soon after, due to his awards at track, Pietro was able to get a loft apartment and began attracting national attention for his speed. 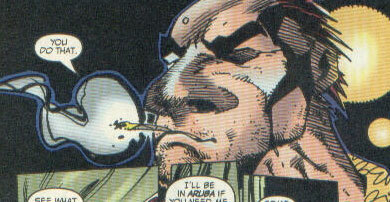 Anya soon found Pietro's location and sent him a cable vaguely explaining that something had happened to Wanda. Pietro almost immediately returned home to find his welcoming father. Pietro demanded to know about Wanda, but Eric explained that they did not know, but that Pietro's abilities would aid him in the work he had begun. After unpacking, Pietro set off on his motorcycle to find Wanda, only to wreck and pass out. He awoke in a hospital room, surrounded by his family, who explained that his legs had been so badly hurt that they were amputated. Becoming a recluse of sorts, Pietro devoted his life to finding his sister Wanda until one day, he received a phone call promising information on Wanda in exchange for a service. Pietro agreed and soon found himself exposing his father. 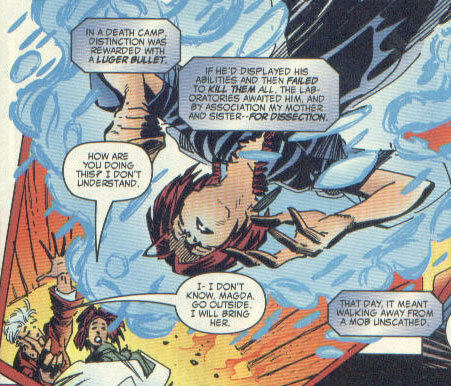 Pietro accused Eric of murder, but Eric tried to explain that the movement he had become involved in had killed Wanda to prove their power to him. An angry Pietro then shot Eric, not realizing that Eric was only trying to protect his family. When he realized his father was not moving, Pietro tried to get Eric to a hospital but was stopped by Anya, who revealed that she had murdered Wanda herself due to Eric's constant anger at her for being normal. Anya now had her revenge and announced that it was her with the power now. Comments: Created by Chris Wozniak. The divergent point for this Earth would be during the flashback seen in Classic X-Men#19 (March, 1988). Though the mysterious cabal that Eric was part of was never revealed, the clues that were given made it seem that it was some sort of anti-human organization. Anya was the eldest daughter of Eric and Magda Lehnsherr, who was born a human. When she was a child, local townsfolk tried to have her and her mother killed because they were different and Eric devoted his life to protecting them. Years later, she led her twin siblings on a hike where Pietro ran away from home to discover the world. In his absence, Anya became a constant target for her father's verbal rage. When news of Pietro's track awards reached her, she contacted him to explain that their sister Wanda was missing. Pietro quickly returned home, only to get in a motorcycle crash that cost him his legs. With Pietro devoting his now-crippled life to finding Wanda, Anya manipulated him into killing their father Eric, thereby gaining revenge on him for the years of abuse. Eric Lehnsherr was a mutant whose magnetic powers first manifested when his family were attacked by local townspeople. He then devoted his life to protecting his family, secretly joining a mysterious cabal. As the cabal began to take a life of its own, Eric began to lose power within the organization and began to take his frustrations out verbally on his oldest daughter, Anya, who had years earlier allowed his mutant son, Pietro, to escape into town. As months passed by, Anya manipulated Pietro into returning home and killing Eric by making it seem that Eric had killed their sister Wanda. Pietro shot Eric, realizing too late that Eric was only trying to save his family. Eric Lehnsherr had the same magnetic abilities of his Earth-616 counterpart. Magda Lehnsherr was the human wife of Eric, who was saved by him from a fire started by local townspeople. Afterwards, she gave birth to twin mutant children and named them Pietro and Wanda. Years later, Magda had grown sick with her twins missing. Pietro was the mutant son of Eric and Magda Lehnsherr. At an early age, he ran away from home to discover the world, living in the streets. He soon made friends that led him to a local school, where he was discovered by the coach there after getting into a fight with the brother of student Tova Voorman. Showing his mutant superhuman speed to the coach, Pietro was soon made a track star. When news of his fame reached his sister Anya, Pietro received a letter from her explaining that their sister had gone missing. 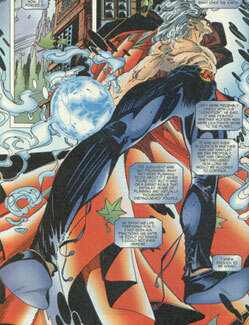 Pietro quickly returned to find his father and accuse him of harming Wanda. That night, he left on motorcycle to find her, but crashed and lost his legs. Devoting his now-crippled life to finding Wanda, Pietro was manipulated by Anya into thinking that their father had killed Wanda. In anger, Pietro shot his father, realizing too late that Anya was the real culprit. Pietro had superhuman speed, like his Earth-616 counterpart. 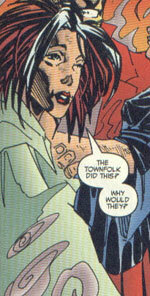 Wanda was the mutant daughter of Eric and Magda Lehnsherr. At an early age, she accompanied her brother Pietro and sister Anya on a hiking trip where Pietro ran away to discover the world. Years later, Wanda was secretly murdered by her sister Anya, who then manipulated their brother Pietro into killing their father Eric. Wanda was a mutant with undefined abilities, though it seemed likely that she possessed the same reality-warping powers of Earth-616 counterpart. Stixx was a member of the secret organization that Eric Lehnsherr was also a member of. He explained to Eric that many members of the organization did not take kindly to Eric having a human wife and child. He then proceeded to take a three week vacation. Tova Voorman was a student at the school where Pietro Lehnsherr had taken residence. He immediately took a liking to her and attempted to impress by any means. When she came crying to him about a "bully," Pietro raced to beat up the bully, only to discover that it was just Tova's brother, whom Tova was messing with. When Pietro was pulled away by the coach, Tova asked Pietro to see her later that afternoon.